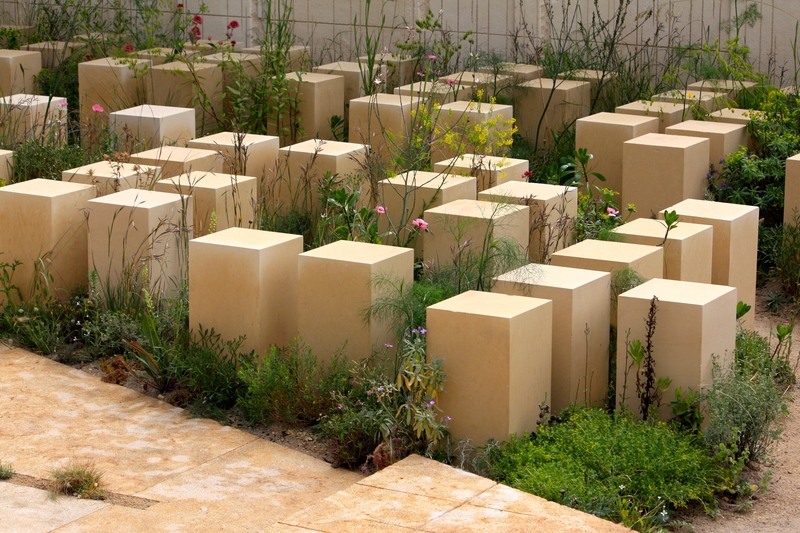 Well slap my thigh and call me Mildred, James Basson won gold and landed this year’s Best in Show for his monumental Maltese quarry garden. Gold was, as I predicted, inevitable, and Best in Show a strong likelihood given the brazen ambition of this project. When James Basson commits to an idea, he sees it through with absolute conviction and brilliant clarity. This was quite some idea. 2017 will be M&G Investments’ final year as sponsor of the Chelsea Flower Show and the wealth management company must be elated at winning the RHS’s top prize. However, the awards did not come without some controversy. If one listened very carefully, one could hear whispered comments passing between the county ladies and country gents as they struggled to get to grips with the austere design and ‘weedy’ planting. I had to agree. I won’t repeat what Helen of Oz had to say … these colonials tell it like it is, but suffice to say that although the garden was impressive and brilliantly executed it was, like a child genius, rather hard to love. I wanted to like it, but I could not even begin to. 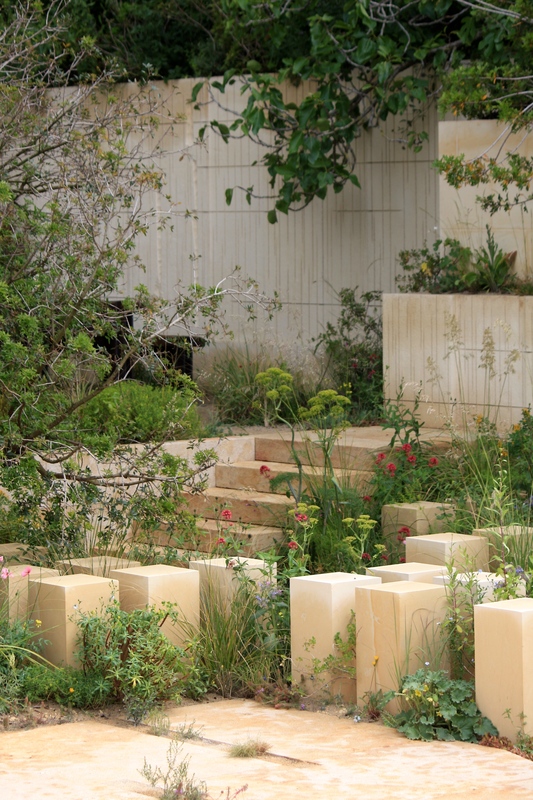 Taking inspiration from the unique Mediterranean landscape of Malta, the design for the M&G Garden evokes an abandoned quarry which nature has begun to reclaim. Each space reflects how that process might take place, with certain plants colonising the drought stricken summits whilst others seek cool shade between the stones. We first saw the garden at about 8.30 this morning when the sun was still hiding behind the clouds. Then it had all the charm of The Barbican Centre on a wet November afternoon, but when the sun shone the garden was warmer, more inviting and certainly closer to the image of a Maltese quarry I’d conjured in my mind. James Basson’s planting is so exactingly naturalistic one could fully believe the plants had established themselves there, but they appear so frail and ephemeral that they look as if they might shrivel away within days. That’s possibly the point I am missing. 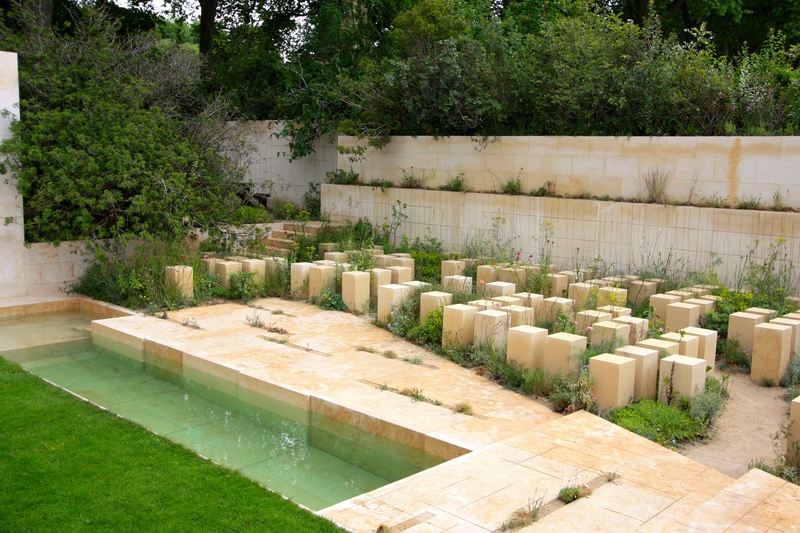 This garden is saved by a trio of imposing limestone pillars (which look like the lift shafts of an emerging skyscraper) and a giant’s causeway of cut and finished blocks. And therein we have it: even the most accomplished of ‘wild’ gardens needs structure to make it great. 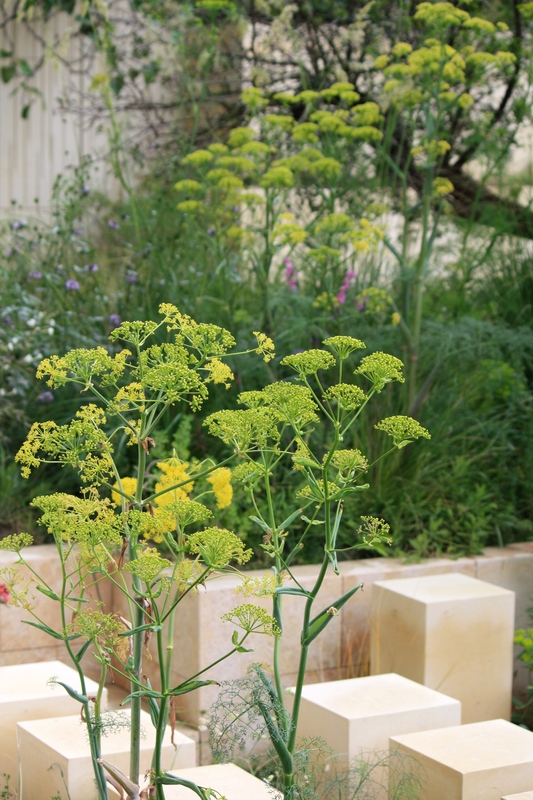 The planting in the M&G Garden is unquestionably Mediterranean but you may not recognise some of the plants. Several were transported direct from Malta by special agreement of the Maltese authorities. These include Euphorbia melitense, Darniella melitense, Limonium melitense and Mattiola incana subsp. Melitense. You have probably deduced by now that the Latin name for a species indigenous to Malta is melitense! If I may be so bold as to make another prediction, and I do not do so unkindly, The M&G Garden will not win The People’s Choice Award. The garden is clever, yes; ambitious, certainly; trend-setting, maybe. But a crowd pleaser? I’m afraid not. I’d love to hear your thoughts and opinions on this polarising garden. In the meantime, here’s the full list of medal winners, followed by a plant list for the M&G garden. I love the brutalist charm of this garden. A wonderful mix of modernity and nature. Definitely will be be looking through some of the plants to consider putting into the non edible parts of the garden. I have to say, I absolutely loved it. I could just imagine how amazing it would be to sit having dinner on a hot summer’s night with candles on the table looking over the blocks, pool and plants. I love wild plants and the natural look of plants, it’s interesting and more beautiful than the superficial perfection of traditional gardens. That said, I fully understand why people don’t like it. You go to a garden show for beautiful flowers and planting combos, not necessarily for nature reclaiming a quarry. This was something very different, it was more art. I loved a lot of the gardens though, especially the more traditional contemporary garden designs. Absolutely – variety is the spice of life. It wasn’t my favourite garden I should say, I think that was possibly the Canadian garden or the Wharf Artisan garden. Which tells me I like wood-sy gardens more than I realised! Finished! If only. I am currently sitting in the library which is a sea of pond liner with a thick layer of dust on top (perhaps this has the makings of a Chelsea garden?) Next weekend the books are going in, come what may! We loved the RBC garden and Morgan Stanley, although hardly ground breaking. Let’s sort a date to meet up. So near, and yet so far. I loved it, although as you say, it really did need the sun to bring it to life. At around 7.30 this evening it was absolutely magical. For what it’s worth, this is why I liked it: https://jannaschreier.com/2017/05/24/chelsea-2017-best-in-show-james-bassons-the-mg-garden/ Completely agree it’s not one I’d want at home though. I’ve already shared my thoughts via facebook, but thx for your excellent blog. The accompanying photographs – yours? – are really good. It’s an impressive project but ultimately I just don’t think it is a garden! 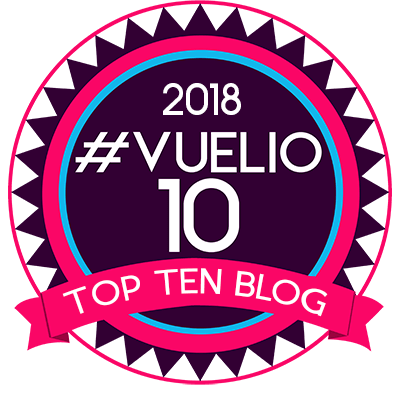 Sadly, I feel the “Best” award had been effectively agreed – based on the proposal and the sponsor – before the show even began. I think I would have liked it more if the plants were placed in Lancelin Pinacles, WAustralia just North from us, I like a more natural setting but what a lot of work you have put into list all these plants!!!!!!! Many thanks for giving us so much detail and your thoughts. The plant list was much appreciated. I get it conceptually, but I don’t like it aesthetically. The hardscape overwhelms the plantings, which is a shame, because I love the plant list…but then I love old-field succession plants (read “weeds”), the asters and the verbascums and the oenotheras and the convolvulus and the daucus, and these are just succession plants made exotic by being somebody else’s…so I’d probably be perfectly happy with the design if it were of a cleared lot grown over, forget the quarry allusion. My own shortcoming, undoubtedly. What a fabulous day we had, and so blessed with the weather and the company. Yes Tina D, I am with you. I get that quarry garden conceptually, but I didn’t like it aesthetically at all. For me, gardens are a respite, an escape to calm and tranquility, not an assault on the senses. Living in an arid environment and dealing with drought and water restrictions regularly, the garden ? didn’t feel special to me at all. I found it quite depressing, and yes I will be blunt, no matter how rare and difficult to cultivate some of those plants were, they looked like weeds to me. Granted, the garden did look better later in the day when the light was less harsh. I also found the use of various types of thistles in quite a few of the gardens quite bewildering as I battle to get rid of these – one year of seeds, seven years of weeds for me, and once those seeds get into the veggie patch,it becomes a constant battle. Loved the Morgan Stanley and Covent Garden presentations. The combinations were beautiful and that I could relate to, as something I could manage in my garden. Really loved the extensive use of peonies in many this years show gardens, especially when combined with lupins, they looked really special. The Real Flower Company floral displays were divine. Beautiful floral creations of massive roses and peonies,woven with sweet peas in the most gorgeous colour combinations. They would be my absolute florist of choice if I lived in the UK. And oh my, the pavilion was wonderful. So many wonderful offerings Loved, loved the new Clematis Taiga – needed to do a double take to check it wasn’t a dahlia. A wonderful Japanese bred plant with double blue/purple flowers and lime green heart. Dibleys Silver Spirit begonia was also another of my favorites. Can’t finish this post without a comment on the incredible Blue Forest Handcrafted luxury tree houses – so magical and so beautifully crafted. Felt like I had stepped into the Enchanted Forest. Best of all, I got to share a fabulous experience, with a very gifted and knowledgeable gardener. I for one am not drinking this conceptual Kool Aid. I am reminded me more of monochromatic graveyard than a quarry. Perhaps one must see it in person to truly appreciate the garden creator’s vision. 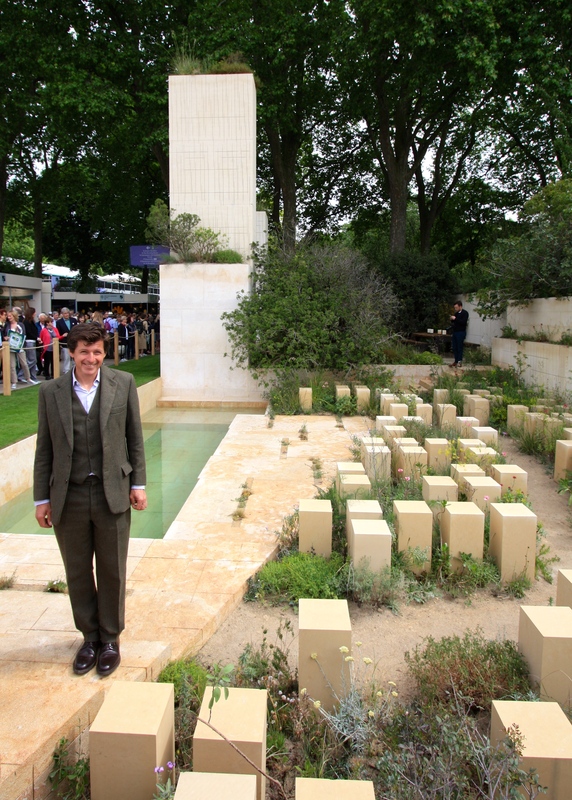 His sweet, silly smile speaks volumes of how these awards are given at Chelsea Garden Show these days. Well, hello Mildred! How right you were! Not my idea of a garden either. I gather the idea is that the vegetation is recolonising the disused quarry so how come the stone has remained so precise and pristine? When I showed the photo to my husband and told him it is best in show he raised his eyebrows in surprise as he thought I was showing him a photo of war graves. I only have photos to go on, but the show gardens don’t seem very impressive. On the other hand I think there are some beautiful examples amongst the artisan gardens. Thanks for the plant list and an always inspiring blog. So agree with you about James Basson’s garden. Having watched his progression over the years from the evocative slice of Provence with the village lavoir, through goat track to this year’s stark offering, I can see how he is pushing himself in interesting directions but he isn’t necessarily taking the public (or me) with him – especially when other show gardens are so thin on the ground. At £100 a time for non-member tickets, this year’s show may well leave visitors feeling short-changed. The RHS will need to pull some rabbits out of the hat to get them back next year. It looks better in your photos than on television. But reminds me unfailingly of war graves and cenotaphs. I hope the show has a replacement sponsor? Malta: well, the plants are rather weedy and the landscape rocky. I’ve seen most of its corners and crannies. I’ve written myself about landscapes being turned into “gardens” and if they can even be so. I’m with Tina D and the many others who responded in a similar way: Impressively executed? Yes. Conceptual art? Yes. Garden? No way! I have only your photos to go by so maybe I’m unfair – but if you had guests round, would they be expected to sit on those pillars as if they were stools and watch whoever was languishing in the pool?? How would you care for your garden and plants without constantly knocking your shins or banging your forehead? Ouch! I felt the pain in my shins when I read that comment, especially having bashed my ankle on a lump of concrete yesterday. Nothing would have inclined me to spend time relaxing in this garden. It had a very sombre, abandoned atmosphere. Maybe it was a gritty garden for the ‘noir’ generation? 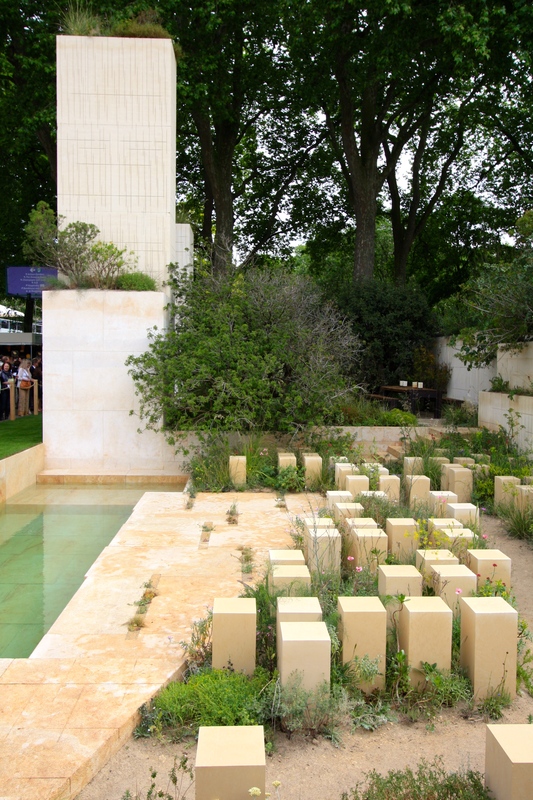 Has the RHS judging panel lost its marbles? “The Maltese Quarry bore a startling resemblance to Middle Eastern (both Muslim and Jewish) graveyards (refer to the hillsides of Jerusalem). How big a carbon footprint does a garden designer have to leave before someone, somewhere, questions his ecological credentials. This site (I can’t, in all conscience call it a garden) was ‘brutalist’ alright. But a garden?- I feel so sorry for those who abided by the meaning of the word. They created inspirational, beautiful places for both man and nature. If James Basson, as he claimed, wants to set an example to the Maltese about protecting the environment, maybe he needs to think again about protecting the world environment and not ship thousands of tons of stone from Malta to the UK. He would make a good architect, without doubt, but a garden designer? …. I agree Susan, it was not a garden as most of us would regard a garden. I appreciate that the designer wanted to make a ecological statement and enjoys using native plants, but I genuinely don’t understand what the judges were thinking of, apart from keeping the sponsors on side.